1. Regular non-carbonated water – I start every single challenge out by sipping regular non-carbonated water and I order it with no ice so that I am able to drink without the ice getting in the way. During milkshake and ice cream challenges, I start with warm water to counteract the very cold dairy. At the beginning of a challenge, the food is warm and delicious, and you are fresh and feeling strong, so there is no need to add additional flavors to your taste buds. Your stomach is still empty for the most part too, so there is no need to add any carbonation to it yet. Begin by using flavorless, cool water when necessary, and then you can switch to something flavored when flavor fatigue starts to arise. You don’t want the water too cold, but cool water tastes better than warm. 2. A non-carbonated flavored beverage – Once flavor fatigue begins to set in and the food starts to not taste as delicious as when you first began, you need to Mix Things Up and one way to do that is by drinking non-required flavored beverages to throw some new flavors at your taste buds and waken them up. What you choose is up to you and mostly depends on what the restaurant or bar has available. It also depends on whether you are trying to limit your calories or not. Some eaters who are trying to limit their calories will bring zero calorie fruit juice flavored drinks, low calorie sports drinks (Gatorade & Powerade), and some even bring diet / low calorie flavor additive packets (Crystal Light) to add to regular water at the restaurant or event. Eaters who don’t really worry about calories tend to drink sweetened drinks such as lemonade, pink lemonade, fruit punch, and sweet tea. I learned from experience that unsweetened tea is not one of my favorite challenge drinks, but it may be for you. If you are trying a really greasy challenge, you will want something sugary and sweet like lemonade because the sweetness will help overpower the greasy flavors and texture from the foods. Hi-C beverages work great too!! 3. A carbonated soda or diet soda (pop) – I try to drink water for as long as possible and then I switch to my non-carbonated flavored beverage and drink that until I am fully done with all of the meats, cheeses, vegetables, and other toppings. Once it is time to eat the buns, breads, french fries, and other high-carb foods, then I switch to carbonated soda. What soda I use mostly depends on the restaurant or bar that I am at and what they readily have available. In the USA, I try to drink Diet Coke or Diet Pepsi because one of those two are always available. Diet Dr Pepper is my favorite but hardly any restaurants every stock it. When I am in Europe and other countries, regular Coca-Cola is usually what they have available so I just drink that. I try not to get caught up in calories from drinks. Eating 6,000 calories and then worrying about the number of calories in your drinks doesn’t really make too much sense to me, but I fully understand those people that are trying to minimize calories and control weight gain. Diet soda vs regular soda is up to you, and the only real difference is the number of calories. 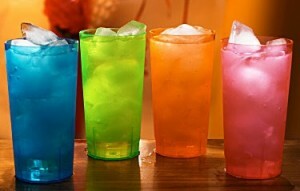 To find out all of the major effects of drinking soda, please read our The Effects Of Drinking Carbonated Soda article. 1. Beer – Every now and then you will come across a challenge at a bar which includes finishing a beer as part of the requirements. In these situations, you obviously have to finish the beer to win the challenge. In all other situations though where you have a choice, beer is not really a recommended drink. You may choose beer, but you will never see a professional food challenger drinking it during the actual challenge. Why should you not drink it? The best answer I can give is because it does not fall into any of the above three categories. Beer is carbonated but it is not sweet, sour, or sugary, so it will not cut the flavor of really greasy foods or do anything else beneficial towards you winning, other then helping to chase the food down your throat. Beer is a beverage that you drink to celebrate after you win!! And if you really do want to win, I suggest drinking something else. 2. Milk – Milk is typically only used during omelet, pancake, and breakfast challenges along with during spicy food challenges, if you are even allowed to drink liquids during the spicy challenge. I have never seen or heard of anybody drinking milk or chocolate milk during a regular situation, but milk would be okay to be used as the non-carbonated beverage recommended in type #2 above. Chocolate milk would have a higher impact than regular milk because of it’s much stronger flavor and taste. Milk is not available everywhere though, especially places that don’t serve breakfast or spicy foods, so you may want to bring your own if milk is your favorite. 3. Coffee – Like milk, black coffee is sometimes used during omelet, pancake, and breakfast challenges, but it can also be used during ice cream and milkshake challenges. The warm heat and robust flavor of coffee helps overpower the freezing cold dairy, and it will bring your mouth back to equilibrium. Coffee is another drink that can be used as the non-carbonated beverage recommended in type #2 above. I have never seen it used during regular challenges such as burgers, hot dogs, and sandwiches, but you are more than welcome to try it out if the restaurant has it available. It is suggested for the breakfast challenges, simply because coffee pairs well with breakfast foods, and it is recommended for dairy related challenges, but I don’t recommend it for very greasy meals involving burgers and fries. It would be better to let the coffee take the place of water than an actual sweet and sugary non-carbonated beverage. Coffee won’t help cut the greasy foods or help power through flavor fatigue nearly as much as the other options listed in #2 above. You are welcome to experiment though if coffee is one of your favorite drinks. You may get weird looks asking for a pumpkin spiced latte with your challenge!! Hopefully now you have a better understanding of what you should drink during your food challenges. If you are attempting a unique challenge other than the standard burger, hot dog, burrito, and sandwich challenges, be sure to check out the specific article and video relative to that challenge type in our Strategies Per Challenge Type section. There is most likely some information about what drinks you should use during that specific type of challenge. The main thing is that you choose beverages that can be placed under those 3 category types above. You need to adapt that information to fit yourself and the preferences of your own taste buds. It really doesn’t matter whether you choose grape soda or Coca-Cola, and it doesn’t matter whether you choose pink lemonade or fruit punch. You will still get the same effects, and it just depends on which tastes you enjoy more. To watch me use drinks to my advantage to win a large burger challenge, check out this video of me defeating Adam’s 18 Wheeler Burger Challenge at The Filling Station down in Miami, Florida. I had to finish a massive burger consisting of 4.5 pounds of meat, loads of cheese, more toppings, and over 1 pound of greasy tater tots. I used water, lemonade, and then diet carbonated soda to help me finish everything and become the first person to win the challenge. Use the tips in this article, and you will be able to dominate your own challenges too!! Thanks for reading “Best Liquids To Drink During Food Challenges” and for using FoodChallenges.com!! To go back and view other Strategies For Specific Foods articles, click here.